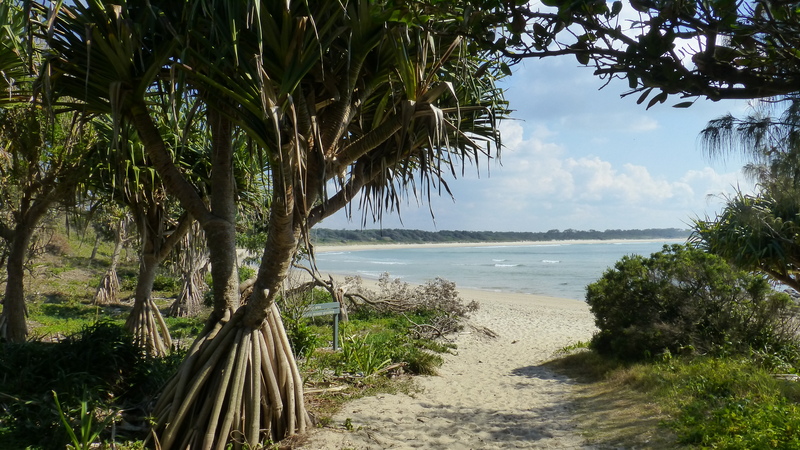 For the keen walker, there are walks in abundance from the village of Iluka. The walk beside Iluka Bay is the gentlest. But there are walks along the beaches facing the Pacific Ocean and even more through a rainforest and through Bundjalong National Park. 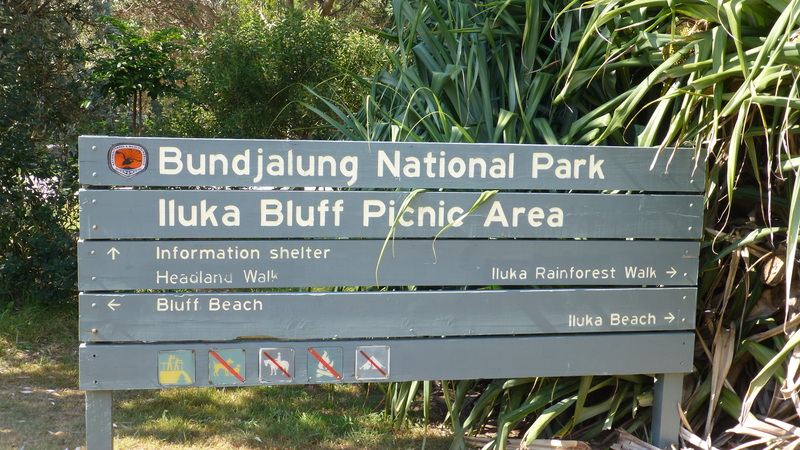 The main road from the Pacific Highway into Iluka goes through the Bundjalung National Park. 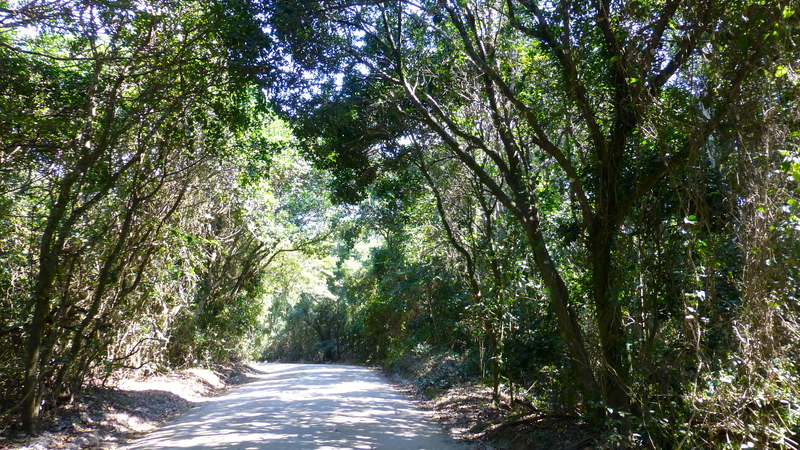 Side roads lead off into the forest and to the bluffs and beaches of the Pacific Ocean. The roads are unsealed but in good condition and the drive through tunnels of trees is a peaceful start to a day out in the bush. 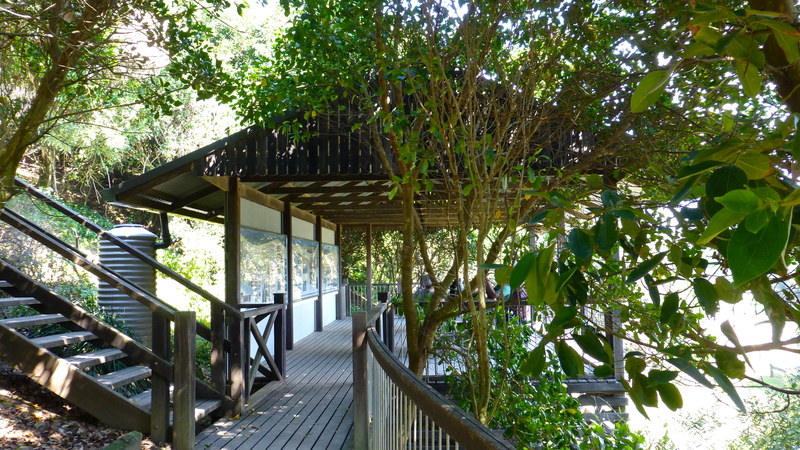 The best known, and very well set up bush parking area is at Iluka Bluff. Leaving the car here, you can choose to enjoy a walk or a rest on the beach, pick your way across the rocks at the headland, climb up to the bluff or walk in the forest; or do all of the above. My first choice was the beach – not to swim or laze in the sun but to walk. When I was there, this beach was not patrolled, so care is needed if swimming. 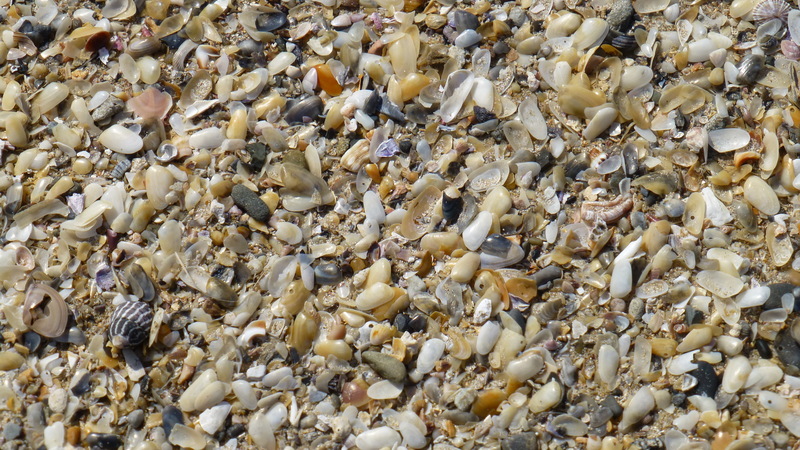 One part of this beach is called Shark Bay – enough said! I shared this long beautiful stretch of coast with just two other people. it was a most pleasant walk. There would no doubt be many more people enjoying this beach in summer. a good pair of walking shoes was essential. 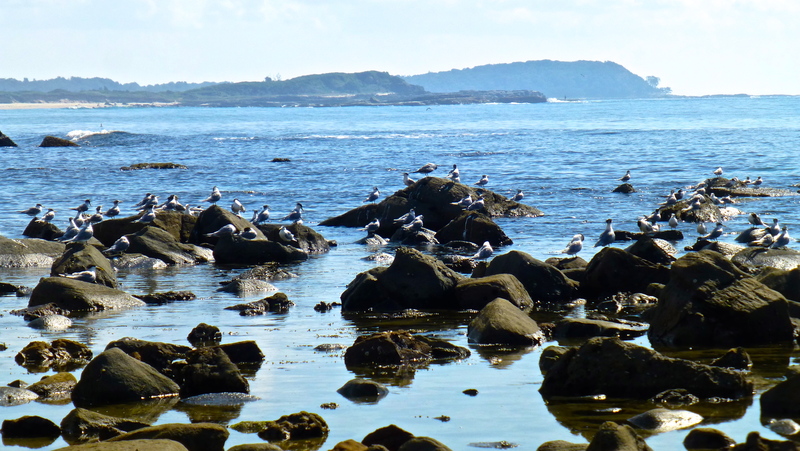 Coming back from my beach walk, I began to explore the rocky headland. It was the resting place that morning for hundreds of birds, most of them small terns. 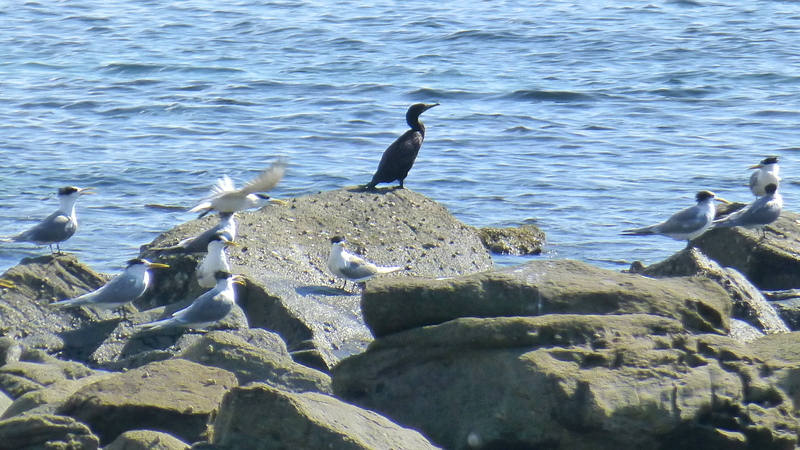 Amongst them were Cormorants and, of course, sea gulls. 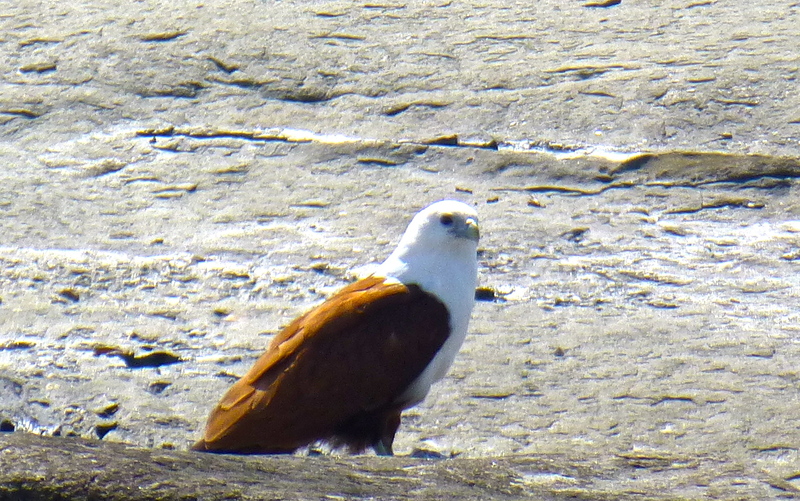 My favourite bird of the morning was this Brahminy Kite (Haliastur Indus). 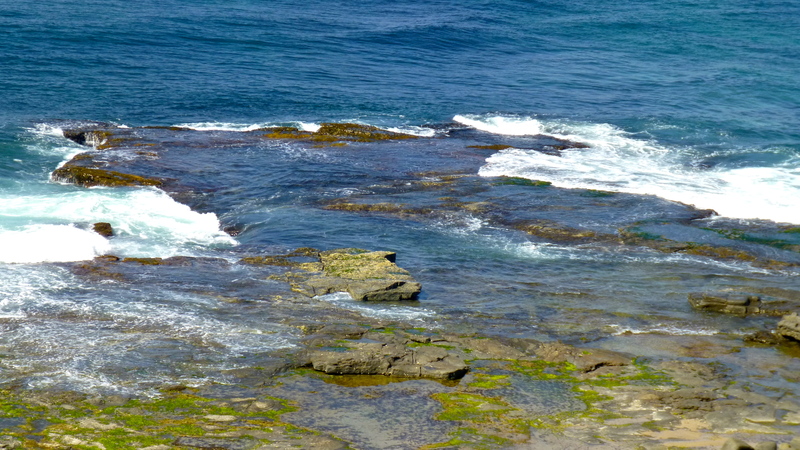 I had taken a short bush walk to get further out on the rocks below the bluff. I found this magnificent bird sitting on a rock shelf quietly finishing off a feed of fish. T’was a magic moment. Brahminy Kites feed exclusively on fish and other marine animals. I have read that they often scavenge for dead fish floating on the surface rather than catching live fish. Once this bird had finished its meal, I enjoyed watching it soar high over the rock platform. Iluka is almost to the southern edge of the Brahminy Kite’s range. 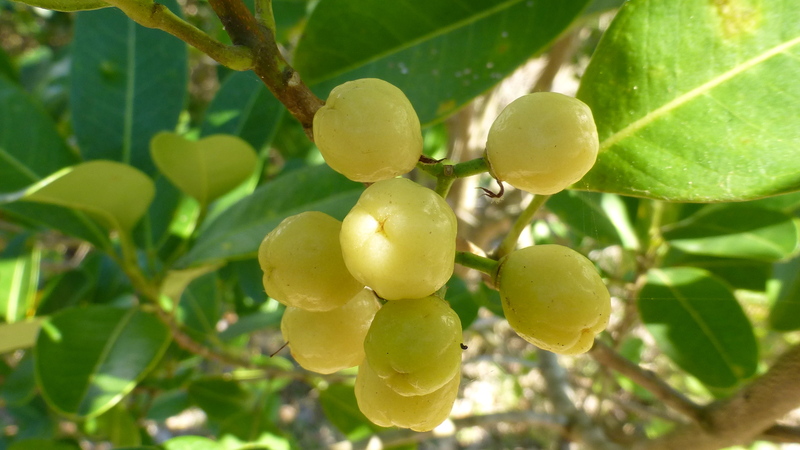 They occur only in warmer coastal areas and on offshore islands; in the eastern states they may occur from Port Macquarie north and, in Western Australia, they can be seen north of Carnarvon. We saw them in the tidal rivers of the Kimberleys when we were there a few years ago. 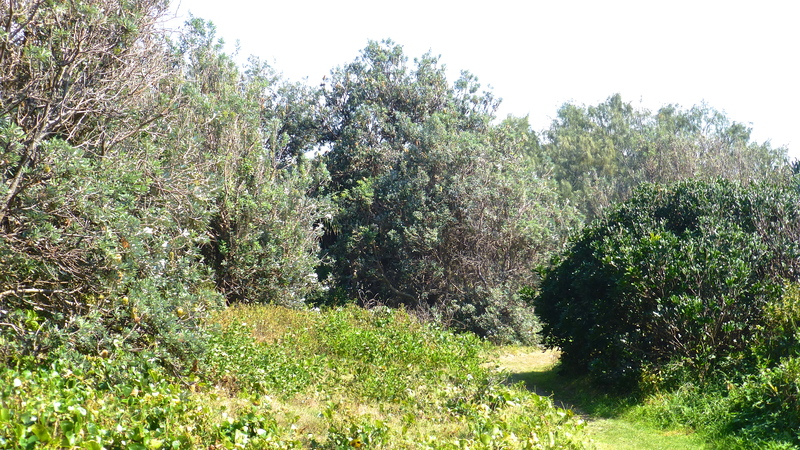 There are good paths through the seaside scrub which seems to be alive with birds. Most are impossible to photograph as they flit through the trees. Some are much more used to human company. 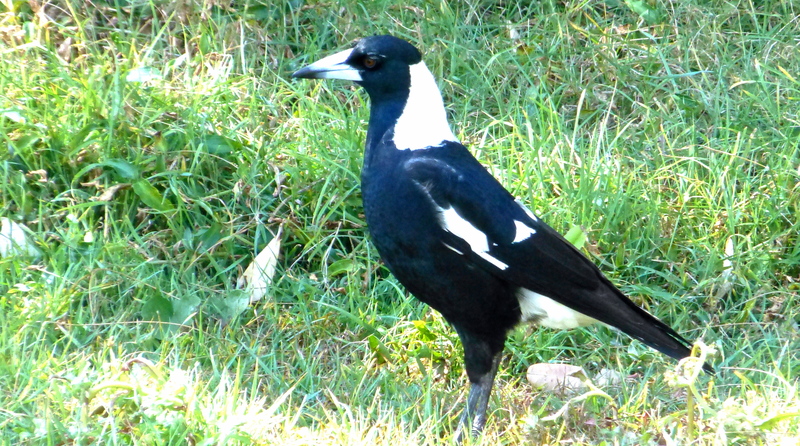 This magpie joined me on my walk. 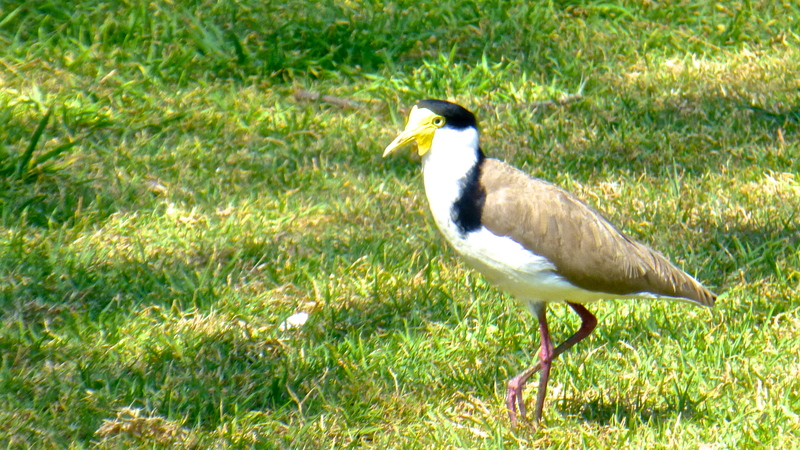 A Masked Lapwing was a little more wary as he trotted across a more open area of park. The common Australian native tree, the Paper Bark, Melaleuca sp., abounds in this park. 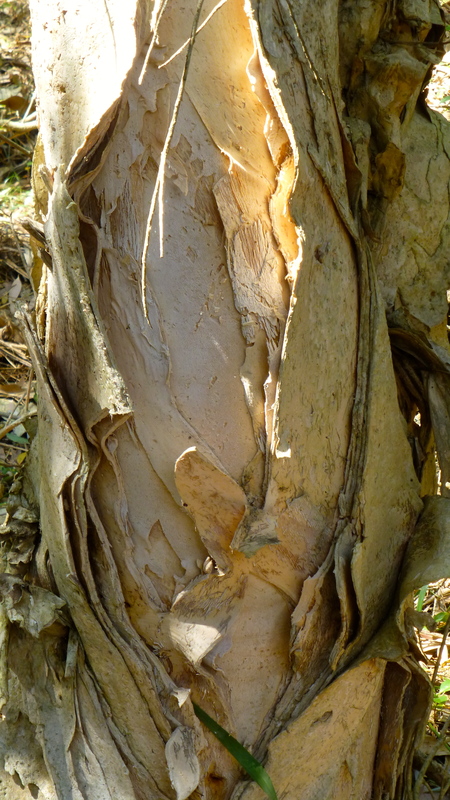 Birds love them and some artists like to use the papery bark in their creations. However, collecting this bark in a National Park is not permitted. Take only photos, leave only footprints – that’s the rule. Day visitors are well catered for with plenty of tables in shady places for picnics. 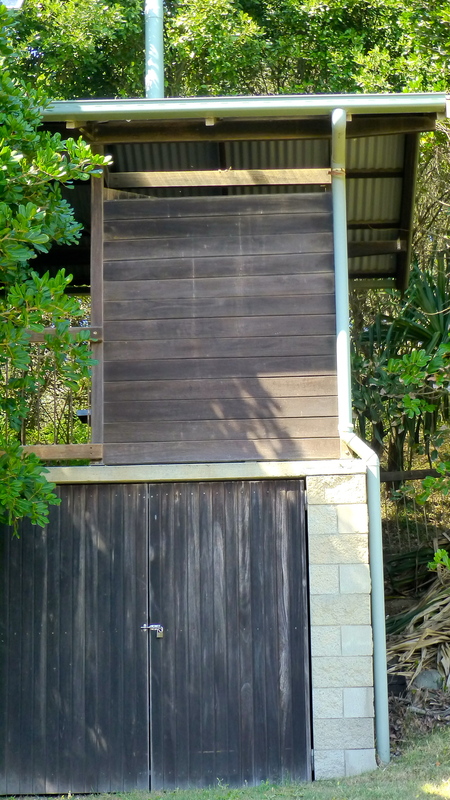 There are also eco friendly long drop, composting toilets near the car park. A shaded, raised information area also has a picnic table and tank water. 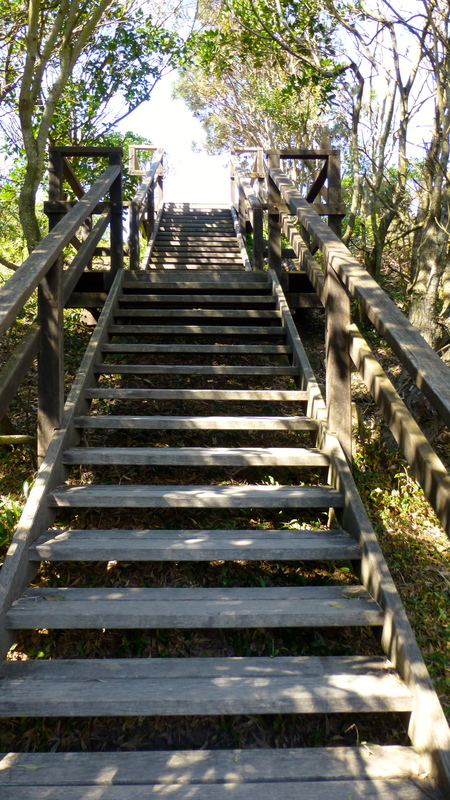 From the information platform, a steep set of steps leads up towards the top of the bluff. From the top of the steps, a steepish gravelled path with steps leads further upwards. 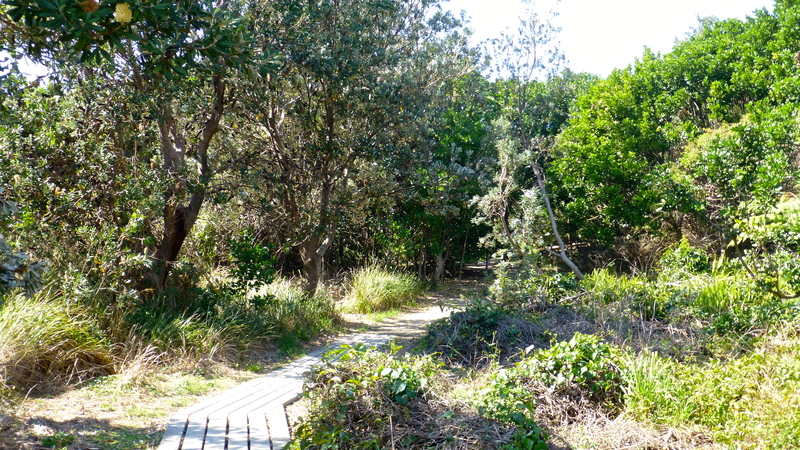 A more gentle board walk path then leads on through the bush. There are some interesting trees to look at along the way. A volunteer landcare group has been busy cleaning out weeds in this area. 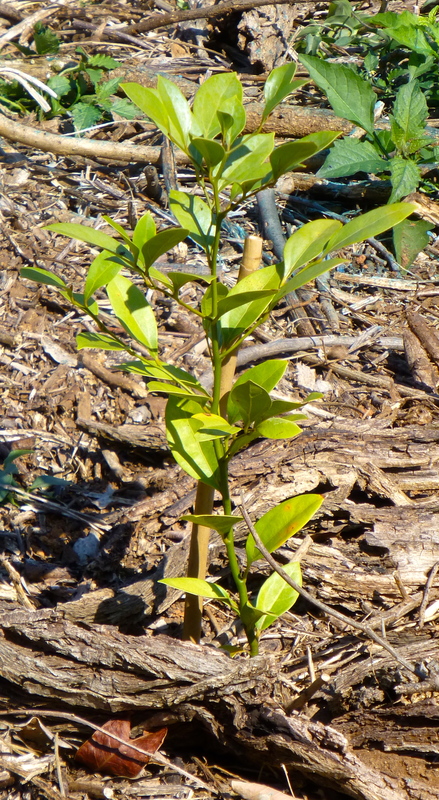 They’ve also planted several more native trees and bushes. Finally, the look out comes into view. And the view from the top is well worth the climb. This is a great place to watch for whales on their migration route. Looking south is the breakwater lined mouth of the Clarence River. 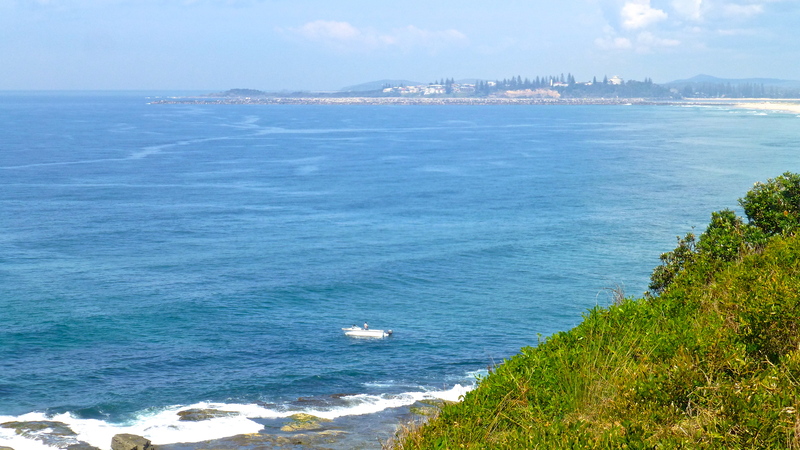 Yamba can be seen on the hill beyond. 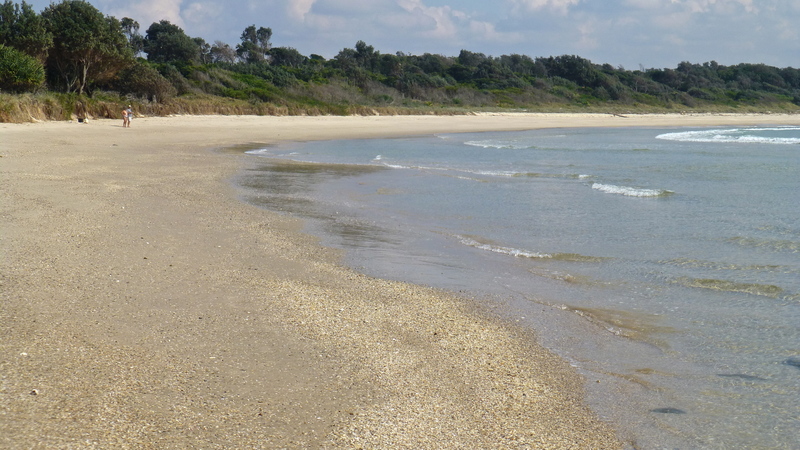 Iluka is further back to the right behind another long, sandy beach. 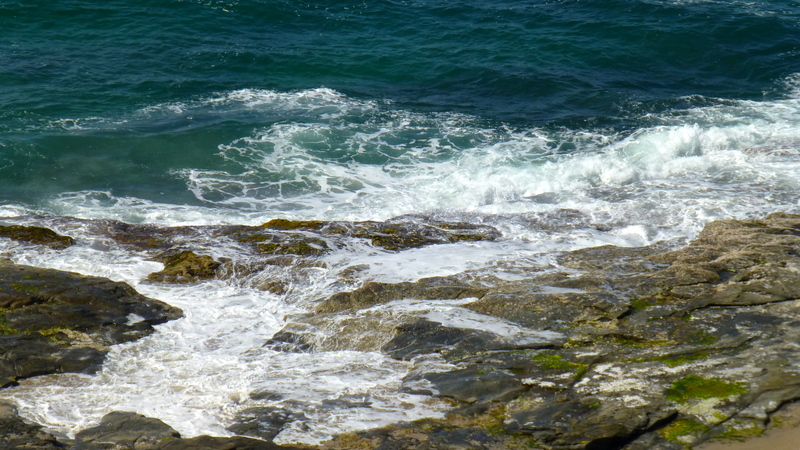 The sound and sight of waves folding over rocks below is something I always enjoy. and enjoy the solitude and the beauty of the sea scape. The other walks will have to wait until I return some other time!